Wish you could try them all? This gift box is a great start. Sample a delicious variety of our classic fruit, nut and specialty flavors. 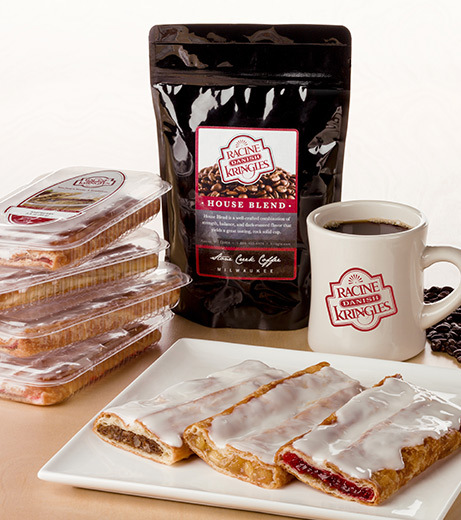 Gift box contains thirteen 3.5oz single serve Kringles, each packaged in its own container: two Pecan, two Almond, three Raspberry, three Apple-Cinnamon and three Cherry-Cheesecake. Add an 8oz bag of our Stone Creek Gourmet Ground Coffee and/or a diner style mug to create the ideal gift. Perfect for someone who wants a slice now and more for later. Sorry, no flavor substitutions. 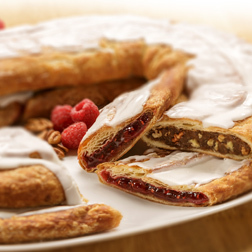 Kringle will stay at its best for about 5 days at room temperature or six months in the freezer. If you don't plan on eating your Kringle for a few days, put it in the freezer, and when ready, thaw at room temperature for about an hour. Wheat flour, margarine (interesterified soybean oil, water, salt, mono- and diglycerides, colored with annatto/turmeric. Calcium disodium edta added as a preservative. Artificial butter flavor. Vitamin a palmitate added. ), brown sugar (sugar, molasses, cane syrup), sugar, pecans, 2% or less of the following: water, corn syrup, eggs, yeast, soy lecithin, soy protein, salt, dextrose, calcium carbonate, maltodextrin, cinnamon, agar-agar, tocopherols preservative, calcium propionate, citric acid, soy flour, canola oil, oleoresin of paprika, titanium dixoide, natural & artificial flavors (milk), malted barley, corn starch, caramel color, annato color. Sugar, margarine (interesterified soybean oil, water, salt, mono- and diglycerides, colored with annatto/turmeric. Calcium disodium edta preservative. Artificial butter flavor. Vitamin a palmitate added. ), wheat flour, eggs, apricot kernels, contains less than 2 % of each of the following: liquid sugar (sugar, water), almonds, salt, soy protein, yeast, corn syrup, dextrose, corn starch, calcium carbonate, maltodextrin, tocopherols preservative, calcium propionate preservative, citric acid, agar-agar, natural and artificial flavors, malted barley, soy lecithin, soy flour,canola oil, potassium sorbate preservative, xanthan gum, color added. Wheat flour, margarine (interesterified soybean oil, water, salt, mono- and diglycerides, colored with annatto/turmeric. Calcium disodium edta added as a preservative. Artificial butter flavor. Vitamin a palmitate added. ), sugar, corn syrup, brown sugar (sugar, molasses, cane syrup), raspberries, eggs, corn syrup, modified food starch, contains 2% or less of the following: water, soy protein, soy lecithin, yeast, dextrose, salt, citric acid, soy flour, canola oil, red 40, natural & artificial flavors(milk), potassium sorbate preservative, sodium benzoate, sodium citrate, tocopherols preservative, titanium dioxide, calcium carbonate, partially hydrogenated soybean & cottonseed oils, maltodextrin, agar-agar, calcium propionate, corn starch, cinnamon, malted barley, caramel color, annatto color, oleoresin of paprika. Sugar, Wheat Flour, Margarine (Interesterified Soybean Oil, Water, Salt, Mono- and Diglycerides, Colored with Annatto/Turmeric. Calcium Disodium EDTA added as a preservative. Artificial Butter Flavor. Vitamin A Palmitate added. ), Apples, Eggs, Corn Syrup, Modified Food Starch, Contains 2% or Less of the Following: Lemon Juice, Soy Lecithin, Soy Protein, Yeast, Dextrose, Sodium Benzoate, Citric Acid, Ascorbic Acid, Natural & Artificial Flavors, Potassium Sorbate Preservative, Palm Oil, Tocopherols Preservative, Cinnamon, Nutmeg, Calcium Carbonate, Maltodextrin, Agar-Agar, Color Added, Calcium Propionate, Xanthan Gum, Guar Gum, Malted Barley, Corn Starch. Wheat flour, sugar, margarine (interesterified soybean oil, water, salt, mono- and diglycerides, colored with annatto/turmeric. Calcium disodium edta added as a preservative. Artificial butter flavor. Vitamin a palmitate added. ), corn syrup, brown sugar (sugar, molasses, cane syrup), eggs, corn syrup, cherries, contains 2% or less of the following: water, modified food starch, salt, cream cheese (pasteurized cream, skim milk, dairy cultures, salt, xanthan, locust bean, carob bean and guar gums, natural flavors), maltodextrin, soy protein, yeast, dextrose, potassium sorbate, tocopherols preservative, agar-agar, calcium carbonate, partially hydrogenated soybean and cottonseed oils, benzoic acid, lactic acid, palm oil, polysorbate 60, citric acid, soy flour, canola oil, red 40, yellow 5, yellow 6, natural & artificial flavors, sodium benzoate, sodium citrate, calcium propionate, malted barley, corn starch, cinnamon, egg yolks, soy lecithin, enzymes, baking soda, color added.